No rest for a weary writer on the weekend, nor should there be! Part of my workload today. It’s 9:31 am as I begin this post and I have to make it short and sweet, because I have a big writing day ahead of me. Actually, I have general housekeeping chores to knockout on top of that, too. Is it me or does folding laundry take up half your day? I’ve got three big reviews for Buzzine that have deadlines looming large on the horizon. The first is for the DVD release of Contract Killers. Basically, it’s a low-budget female version of a Bourne movie. Though it’s easy to discount the film based on that discouraging summary alone, once you lower your expectations, it’s actually pretty entertaining, especially towards the end. 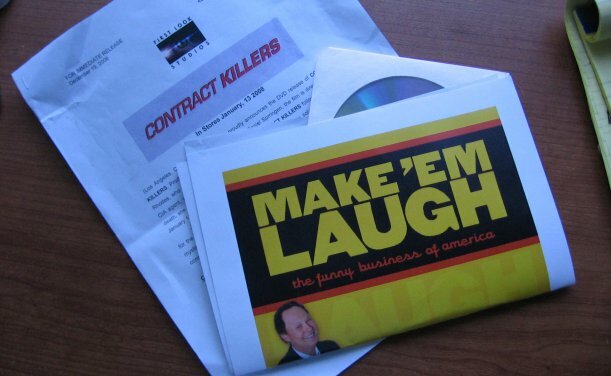 The second review is of Make’em Laugh: The Funny Business of America. It’s a PBS special about the history of comedy in America that’s set to air soon. It’s a three-part DVD set and I haven’t watched any of it yet. So sometime today I need to block three to four hours and just curl up in front of the TV with a steaming bowl of Ramen noodles. Third, I have turn in my movie review of a film I screened this past week. I’m going to keep the name hush-hush for now so that the Google spiders don’t go tattling to the studio, but I’ll let you all know by the 16th. Looking back over these assignments, it probably doesn’t seem like much work to review things. Just keep in mind that not all writers are at liberty to state their untrammeled opinions. In my case, there are other considerations, like relationships with businesses, studios and influential people in general, but I’ll talk about this at length in a later post. Lastly, I took home some work from my day job. I’ve been loathe to do that ever since they took away my salary status. Now that I’m a rank and file wage grunt, I don’t feel comfortable working for free. I’m doing it now only as a favor to my supervisor who has shown himself to be one of the “good guy” bosses of the world. Tough times in the workplace due to economic hardships can really test a manager and he’s handled himself with aplomb, class and compassion. I’m not going to make this habit, mind you, but I’ll help him meet a department deadline once in a while. With that said, I’m going to get cracking, so I’ll see you again tomorrow.